NEW YORK – The announcement of Virginia Senator Tim Kaine as the Democratic vice-presidential candidate brought mixed reactions from his own party’s faithful, with many welcoming his good character, experience, and appeal to moderates, while others questioned his commitment to a “progressive” agenda. Much the same could be said of the discussions that Hamodia held with those in the Jewish community who have come in contact with the senator. Those interviewed offered unanimous praise for his “evenkeeled” and “sincere” personality, and varied reviews for his stance on the issues. 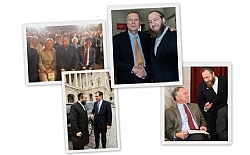 Ezra Friedlander, CEO of the Friedlander Group, which recently organized an event that included Sen. Kaine, described him as “very mentchlich,” gentlemanly. “He is very down-to-earth and unpretentious. In the current political climate, that’s very endearing,” he said. Mr. Friedlander was one of many who felt that the senator’s strong personal commitment to Catholicism would give him an especially sympathetic ear to the religious liberty needs of faith communities. “A person’s background inevitably infl uences his outlook, and I think it will give him the ability to relate to the concerns of Orthodox Jews and should make us comfortable with the idea of having him as vice-president,” he said. 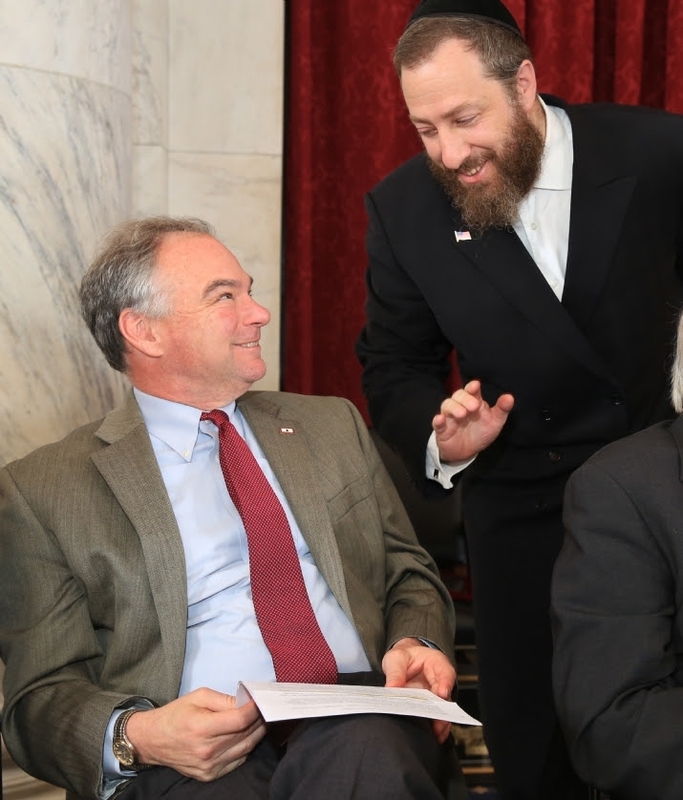 “I wouldn’t count on it,” said Rabbi Sender Haber of Norfolk’s Congregation Bnei Israel, in response to whether Sen. Kaine’s personal religious beliefs would make him a moderate voice on religious liberty issues in a left-leaning administration. A Virginia askan, who asked not to be named, said that while Kaine seems very comfortable speaking openly about his strong Catholic beliefs, it has had little to no e ect on his voting record when it came to issues that confl ict with the prevailing “progressive agenda.” As an example, he said that while espousing a personal pro-life stance, Sen. Kaine has supported all legislation contrary to that position. “I do not believe he will make social conservatives any less wary of Clinton. In fact, he arguably has a more liberal voting record than the senior Senator from Virginia, Mark Warner,” said the askan. In recent years, Virginians who send children to private schools have enjoyed a relatively generous tax credit program. However, those who were involved in lobbying e orts on behalf of the Jewish community said that due to Kaine’s opposition while governor, the program could not be passed until he left office. During the Gaza War of 2014, Sen. Kaine made several strong statements advocating the State of Israel’s right to defend itself; however, his vocal support for the Iran nuclear deal drew the ire of many of the state’s Jews. Jeff Brooke, president of Congregation Bnei Israel of Norfolk, a member of the Virginia-Israel advisory board, and state chairman of the Republican Jewish Coalition, said the Iran deal was one of several decisions that were “very troubling” vis- à-vis Israel. “He has shown some balance at times, but he refused to attend Netanyahu’s address to Congress and is endorsed by J Street, and of course his position on Iran was very disappointing,” he said. Rabbi Dovid Asher of Richmond’s Knesseth Beth Israel thought the senator’s position on the Iran deal was unfortunate. However, after joining a meeting where he discussed the subject with leaders of local Jewish organizations, Rabbi Asher said he felt Kaine’s motivations were largely positive.